The Raptor Engineering Precision 3-Channel Delay Generator [DLY3CH] is a high performance 2.2ns- 12.2ns independent delay generator. This board utilizes three Micrel 100EP196VTG precision delay generators, and can adjust each channel's delay in +/-10ps increments. 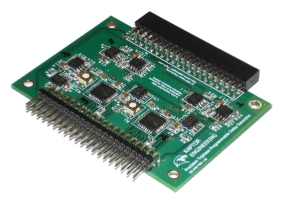 Additionally, a +/-30ps analog fine tuning control is provided on each channel to allow for precise edge synchronization in almost any application. To align input clock edges, the RF input to each delay generator is registered, and a single RF clock input clocks each of the three input registers.